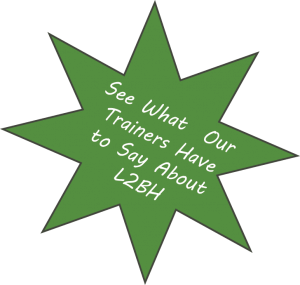 Live 2 B Healthy® Personal Trainers customize and lead training classes on-site at senior residential communities. The trainer’s role is to design exercise classes (utilizing our proprietary protocols) appropriate to participants’ physical abilities; lead enjoyable, interactive, motivating and safe fitness classes; assess class participants’ progress 3 times per year; and support the Live 2 B Healthy® home office and / or franchisee in developing a successful business. 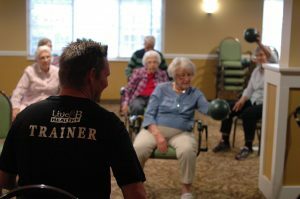 Live 2 B Healthy® Personal Trainers ensure that senior residents use safe and proper form when exercising. Trainers encourage class participants to safely stretch their ‘comfort zone’ both physically and interpersonally, often encouraging senior residents to try fitness exercises exceeding what might be tried if the resident were working out alone. As motivators and leaders, Live 2 B Healthy® Personal Trainers must be outgoing, personable, enthusiastic and positive. They must be willing and able to motivate a variety of individuals with varying physical and cognitive abilities. Positive Attitude – Fosters health, happiness and success by focusing on the positive. Shows leadership by managing trainer’s own personal stress, and by leaving negative moods outside the classroom/community. Awareness – Maintains awareness of changing dynamics every day. Manages own emotions by staying calm and clear-headed in times of high stress, crisis, or in emergencies. 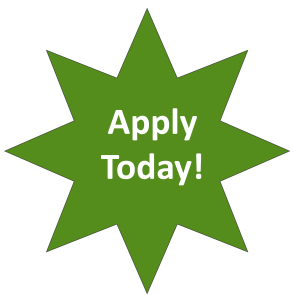 Enthusiasm – Shows genuine enthusiasm and passion. Carries an energy that motivates others. Respect & Honesty – Listens sincerely without judgment. Recognizes individuality and appreciates it. Remains open and honest about what exercise can and cannot do to minimize, stabilize, and improve specific health conditions. Is realistic in goal-setting with clients. Creativity – Is prepared for the unexpected, and has confidence to try out new ideas. Flexibility – Knows each client’s personal health, fitness and mobility status. Makes any exercise adaptations required. Competency – Follows the physical activity guidelines in the health and fitness industry, and continues ongoing professional development, always keeping up-to-date in our growing industry. Updates and practices safety and emergency procedures regularly, reviewing and refreshing at least annually. Positive Reinforcement – Knows the importance of positive reinforcement and the most effective ways of ensuring that it’s truly heard by the recipient. Provides and receives client and community feedback on a regular basis. Discipline & Courtesy – Arriving promptly to class, and notifies residents and the community as quickly as possible in the rare instance that a schedule change is necessary. As well, keeps confidential, up-to-date client records documenting attendance, improvements, adjustments, unusual reactions or atypical behavior responses. Already Certified? Contact us to inquire about opportunities in your area.